Most Americans Don't Trust Trump With Nuclear Authority. You don't say. I brought that up the minute they swore him in! smr wrote: Ok GC, do you still think that the Obama Administration was not spying/illegal wiretapping Trump. The FISA memo was just released. Where exactly? Can't seem to find a copy online. Reportedly, one of the very earliest tips to the FBI was from Dutch Intelligence, who had a Russian government hacking group penetrated six ways from Sunday and saw them launch their attack against the US. Irregardless of gcomeau's psychic vibes as to content. I couldn't the FISA memo either and if it had been released every major conservative outlet would be leading with it. What was released was that some IT geek at the FBI was able to recover the missing text messages from two FBI agent who should be demoted to the lowest possible rank and send to chance bank robbers in northern Alaska. The memo you are looking for is, or was yesterday, on Alex Jones site. And had little to nothing to do with the headlines that accompanied it. Annachie wrote: The memo you are looking for is, or was yesterday, on Alex Jones site. Actually he didn't have it but claimed he did. Alex Jones is a wild-eyed conspiracy theorist. Most of what he says is a mixture of fact, fiction and delusion. However he is known for occasionally being right i.e. every once in a while one of his conspiracy theories turns out to be accurate. So one can't entirely ignore him. In some ways the situation reminds me of the Mel Gibson movie conspiracy theory. Although I thought the plot would have been much better if Mel were a cynical con artist deliberately faking conspiracy theories for the cash and then having one of them actually be true than the brain damaged former secret agent he actually played. First: Would be very interested to hear what conspiracy theory of Jones was ever right. Second: NO. We can absolutely ignore a lunatic delusional paranoiac who spends most of his time making things up for the sole purpose of whipping up a mob. That is in fact the responsible thing to do, and it is recklessly irresponsible to give him attention just because once upon a time he might have accidentally said a true thing. Scary - I actually agree that the description "lunatic delusional paranoiac who spends most of his time making things up for the sole purpose of whipping up a mob" is more or less accurate. I do however prefer to keep an eye on him, although not to the extent of wasting time reading his blog on a routine basis. Remember he is an influential nutcase. 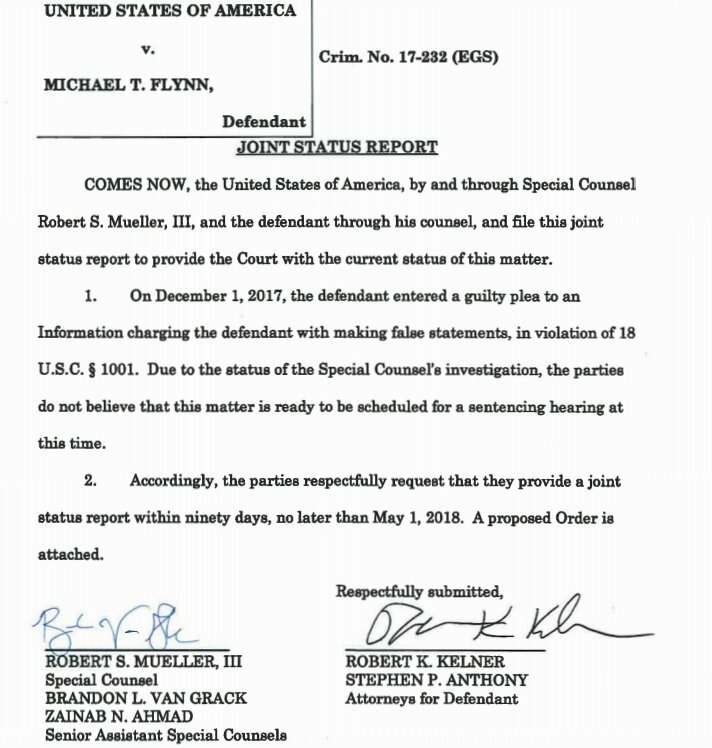 Due to the status of the Special Counsel's investigation, the parties do not believe that this matter is ready for a sentencing hearing at this time". In other words... Flynn's plea deal involved him getting a break on his sentence commensurate with his contribution to the investigation.... and Trump's former National security Advisor is STILL in the process of spilling his guts and contributing materially to the investigation so they're not ready to take his full contribution into consideration in his sentencing. Ok, this is getting beyond seriously concerning. 1. Nunes is refusing to say whether the White House was involved in drafting the memo, which is a difference between already extremely shady political game playing and actively conspiring with the targets of an active investigation to attack and undermine the investigators. 2. The minority members of the House Intel committee just discovered that after the committee voted to authorize releasing the memo Nunes secretly altered it before sending it to the White House. So he sent them a memo the committee had NOT authorized to be released. When does it cross the line Trump supporters? Do you even *have* a line?? ?